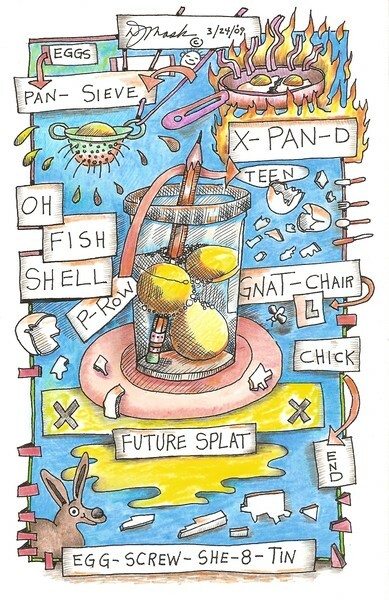 Pencil and eggs is from the sketchbook series. First penciled, then inked and finished by hand coloring with pencils. All David Mask images are copyright Protected 2009. Reproductions of any kind are prohibited without a written agreement with the artist. David, what can I say, very good work. Keep it up and please don't let the men in grey get you down. VERY INCREDIBLY DONE, DAVID. SO MUCH WONDERFUL DETAIL. AWESOME. Artist Reply: Thanks Sharon...I'll put a couple of these on a week. It's a series I've been doing. What do you think of the lay-out? The glass with the eggs references the photo I put on a few days ago. That animal on the bottom left is supposed to be a rabbit but it looks like an escapee from the Simpson's backyard zoo.